HOLLIS, N.Y., Dec. 18, 2018 /PRNewswire-PRWeb/ -- Arch Auto Parts, a leading aftermarket retail and wholesale auto parts supplier in Brooklyn, Queens, and Long Island, NY is celebrating its 40th anniversary with a video billboard in Times Square. Throughout the holidays, including the famous New Year's Eve celebration, millions of New Yorkers seeing the ad are discovering they have a local alternative to the big chain stores, where they can find higher quality car parts for domestic and import cars, at lower prices, from the best automotive brands. Locally-owned Arch Auto Parts, with neighborhood stores in Brooklyn, Queens, and Long Island, provides '50,000+ OE-quality parts and low prices. NY-Fast!™' The ad spotlights OE-quality parts Arch stocks from Bosch and DENSO, two of the most important original equipment manufacturers (OEM) for the world's automotive industry. "When your friend turns 40, you throw them a big party. When your business turns 40, you get a billboard in Times Square and celebrate at one of the world's biggest parties," laughs Chris Bodh, Owner and CEO. The Arch Auto Parts ad is running November 15, 2018, through January 31, 2019, at 1500 Broadway and 43rd St., in the heart of the Times Square bowtie area, above the pedestrian-friendly Times Square Plaza. This is where the ball drops on New Year's Eve, the concerts are staged, and a worldwide audience estimated at over a billion people watch on television as they ring in the New Year. Last year on New Year's Eve alone, approximately 2 million people were packed into Times Square, and most of them were there all day to guarantee a spot before the festivities began. Even on typical days, hundreds of thousands of people pass through Times Square daily, and the billboards are one of the main attractions. This year, these commuters, holiday shoppers and New Year's Eve revelers will see Arch Auto Parts on one of the biggest platforms in the world. The billboard wraps around a high corner building on Broadway, significantly increasing the visibility of this winter-themed ad. The left side of the billboard animates Arch Auto Parts' "Right parts, Right now®" service promise, with a car that stutter-stops in front of an Arch Auto Parts store. Exactly the right parts fly out the door, self-install under the hood, and the car zooms off, "NY-Fast!™"
The right side of the billboard features Bosch and DENSO, two of Arch Auto Parts' top suppliers. The first video is for Bosch ICON™ windshield wiper blades, an excellent wiper for improving visibility in winter sleet and snow. Next, the DENSO ad for spark plugs encourages shivering viewers, "If the weather outside is frightful, let's go find your happy place." "With DENSO, you're ready." as a classic cruiser drives down a sunny beach. These ad components all work together to communicate that this winter, Arch Auto Parts is where to find OE-quality auto parts from top name brands. In NYC, there is a constant flow of traffic between the boroughs. This is especially true on weekdays, with the population of Manhattan nearly doubling from 1.6 million to 3.1 million people on a typical workday. Many of these commuters come in from Brooklyn, Queens, and Nassau County where Arch Auto Parts has a large presence. These areas also have a high concentration of repair shops, so naturally, it is a destination for buying auto parts. Arch Auto Parts has been a local favorite with top-rated repair shops for high-quality parts and low prices for four decades. More recently, Arch has been increasing awareness among retail shoppers. So far in 2018, Arch Auto Parts has received over 440 reviews on Google averaging 4.4 stars out of five. "We know from our experience and data that once they're in the door, we will likely have a long-term customer. 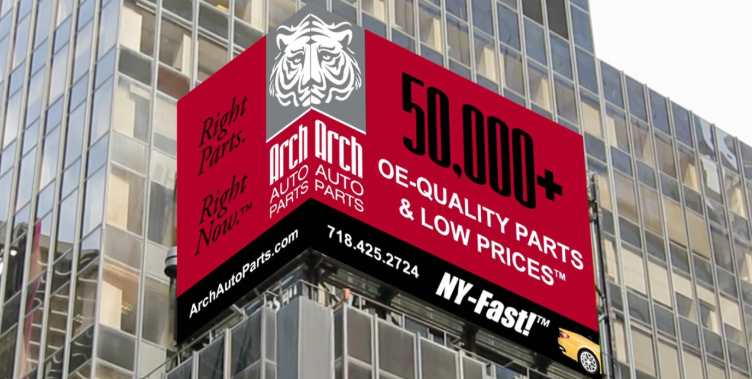 This billboard is helping get the word out that Arch Auto Parts has the name brand, OE-quality parts, fast service and low prices shoppers want," notes Lucy Henner, VP Marketing, Arch Auto Parts. Founded in 1979, Arch Auto Parts' thirteen locally owned and operated stores in Brooklyn, Queens and Long Island, NY, serve professional service and repair shops, dealers, and truck and commercial fleets, as well as DIY mechanics and other retail customers. Arch Auto Parts delivers unsurpassed customer service and discount prices on a wide selection of OE-quality auto parts and supplies from AC Delco, Advics, Aisin, Akebono, Anchor, AP Exhaust, Arc, Arnott, Bando, Beck/Arnley, Bosch, Carter, Centric, Chemours, Continental, CRP, Delphi, Denso, Dorman, East Penn/Federated, FCS, Fel-Pro, Four Seasons, GMB, Grote, Hastings, Hella, Hengst, K&N, KYB, MAS, Maval, Moog, Motorcraft, MPA, National, NGK, OSC, Pagid, Pentosin, Premium Guard, Prenco, Standard Motor Products, Stant, Sylvania, TrakMotive, Trico, TRW, TYC-Genera, URO Parts, US Motor Works, Valeo, VDO, Wagner, Walker and other trusted brands. Arch Auto Parts stocks more than 50,000 OE-quality car and truck parts for domestic and foreign vehicles, including parts from original equipment manufacturers (OEMs) and hard-to-find parts not available at national chains. Parts stocked include brake pads, drums and rotors; wheel hubs and bearings; motor mounts, chassis and control arms; steering and suspension parts; cabin filters, oil filters, fuel and emission parts; sensors and switches; belts, hoses and water pumps; ignition, batteries, starters, alternators and distributors; heating and air conditioning; wiper blades and bulbs; and hard-to-find car parts such as window regulators and wiper motors. Arch Auto Parts is open seven days a week with experienced counter staff dedicated to helping New Yorkcustomers find the exact-fit parts they need in-store. Most Arch Auto Parts orders are ready for in-store pick-up in 30 minutes or less. For more information, visit us at ArchAutoParts.com or call 718-425-ARCH (718-425-2724). Arch Auto Parts, an auto parts supplier in Brooklyn, Queens and Long Island, New York, has reported strong sales of OE-quality parts resulting from explosive growth in rideshare services Uber, Lyft, Juno and Via, and on-demand delivery services. In the past four years, NYC ride-hail app pickups have grown from zero to 15 million trips per month, according to NYC Taxi & Limousine Commission (TLC) data, via toddwschneider.com. About half of NYC ride-hail pickups are in the outer boroughs, where taxis have historically been less prevalent. Ride-hail app services now make approximately 10 times more pick-ups than green and yellow taxis combined in the outer boroughs. The surge in Uber, Lyft and other commercial drivers is good news for Arch Auto Parts, which reports a spike in demand for competitively priced, OE-quality parts. To maintain their TLC license, vehicles used for Uber and Lyft must pass inspections at least every four months, so drivers stay on top of service and repairs and closely track expenses. Arch Auto Parts says it provides these independent contractors in-stock availability of OE-quality parts, at deep discount prices typically only available to commercial fleets. In New York City, ride-hailing services made 65 percent more pickups than taxis by late 2017, according to NYC TLC data. In January 2018, there were approximately 564,000 daily ride-hail app pickups, including Uber, Lyft, Juno and Via. Compared to 12,600 total yellow taxis dispatched per week in January 2018, there were 58,500 vehicles providing Uber service, many of which also work with Lyft, Juno, Via or other rideshare or delivery services. In Manhattan, taxis and ride-hail app services now make about the same number of trips. Strongest ride-hail growth is in Queens and Brooklyn. Based on data Uber provided the New York Times, more than 50 percent of NYC Uber rides originated outside Manhattan in 2017­, even excluding pickups from JFK and LaGuardia (LGA) airports. Over half of the areas where Uber reported big increases in pickups were in Queens, including St. Albans, South Jamaica, Laurelton, Springfield Gardens, Rosedale, Bayside and Glendale. Long Island City, Queens now hosts major driver centers for Uber and Lyft, as well as a TLC office. Brooklyn has seen similar annual growth, with almost four times more weekly Uber pickups in the Flatlands neighborhood, and three times more pickups in Starrett City. Uber, Lyft, Juno and Via pickups from JFK and LaGuardia airports roughly tripled from 2016 to 2018. Ride-hail services and taxis now make about the same number of airport pickups. Arch Auto Parts stores near JFK and LGA airports report a similar increase in rideshare drivers at their stores. Arch Auto Parts offers drivers find the highest-quality national brands, including many of the OE parts that were specified and engineered for domestic and import vehicles on the assembly line. The company says customers who want to maintain or restore the comfort and performance of their vehicle often find parts from their vehicle’s OEM at Arch Auto Parts, including parts from Bosch, DENSO, Continental, Aisin, Arnott, Akebono, Delco, Motorcraft, NGK, Trico, Hella, Hengst, Chemours (formerly Dupont), Sylvania, TRW, VDO and more. For example, for Toyota Camrys, one of the most popular Uber vehicles, Arch Auto Parts stocks parts from the OEM for the radiator, compressor, alternator, starter, cabin filter, oxygen sensors (O2 sensors), brake pads, water pump, timing kits, freon refrigerant and more. With their Arch Loyalty discount, drivers typically save 15 to 40 percent over prices at other parts stores. Arch Auto Parts also has become one of the top choices for many independent contract drivers for delivery services, including Caviar, Uber Eats, DoorDash, Postmates and GrubHub. The company says delivery drivers appreciate the convenience of picking up car parts almost as fast as they pick up meals for delivery. Ninety percent of shoppers find the OE-quality parts they need in-stock at the counter at Arch Auto Parts, according to the company. Online shoppers will find most parts ready for in-store pick up in 30 minutes or less.